TORONTO, May 28, 2013 /PRNewswire/ – Scotiabank reported second quarter net income of $1,601 million compared with net income of $1,460 million in the same period last year. Year over year, net income grew 10%. Diluted earnings per share were $1.23, compared to $1.15 in the same period a year ago. Return on equity remained strong at 16.2%. “Canadian Banking had a very good second quarter, with net income of $547 million. There was strong asset growth across most businesses, as well as a solid contribution from ING. Our retail credit portfolios also continue to perform well. “International Banking reported another solid quarter with net income of $471 million. Our well diversified platform continues to deliver positive results. Strong retail and commercial loan and deposit growth in Latin America balanced the more modest growth in the Caribbean. In Asia, we also saw a healthy contribution from our investment in Thanachart Bank in Thailand. Provisions for credit losses remain within expectations and have risen in line with growth and changes in product mix, primarily in Latin America. “With net income of $335 million, Global Wealth Management had a very strong second quarter. Operating revenues were in excess of $1 billion for the first time and ScotiaFunds mutual fund sales were a record high. There were very good results from our international operations with strong growth across our wealth and insurance businesses. This quarter we also acquired 50% of AFP Horizonte, a pension fund management business in Peru which will provide greater scale to our existing pension fund management business in Peru. “Global Banking and Markets had a solid quarter with net income of $361 million. There were good contributions from the lending and most capital markets businesses despite overall lower market activity and some market-driven challenges in commodities. Results also benefitted from higher new issue revenues and strong brokerage commissions. “The Bank continues to maintain strong, high quality capital levels. The Bank’s Common Equity Tier 1 capital ratio, on an all-in basis, was 8.6%, well above the 7% minimum. 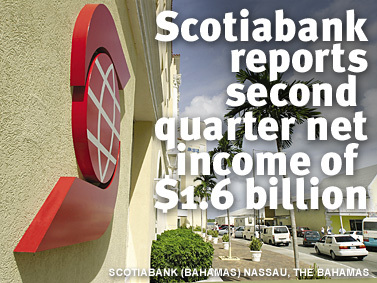 Source: Scotiabank – Financial Release Statement.